In 2000, the Museum of Fine Arts in Boston, Massachusetts held one of the great glittering exhibitions of tiaras: "Crowning Glories: Two Centuries of Tiaras." Sponsored by Chaumet, the exhibition included a dazzling array of sparklers, including pieces that were worn by royal and noble ladies. The entire affair was curated by Diana Scarisbrick, a historian noted for her work on jewelry. 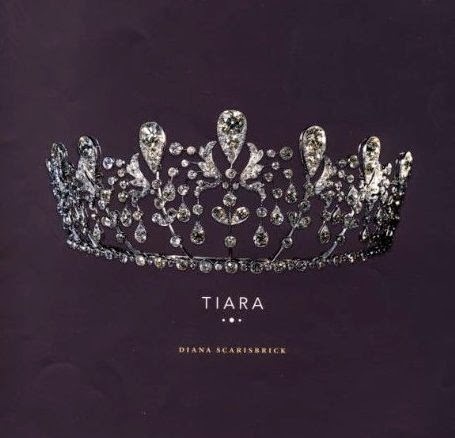 As a companion piece to the exhibition, the museum also published a book, Tiara, in which Scarisbrick relates many of the stories behind the sparkling pieces included in the show. Tiara was published by Chronicle Books in 2000, and it's a pretty substantial tome for an exhibition companion. It's more than a catalogue, as Scarisbrick has incorporated a significant amount of text to accompany the pieces that were shown, but it has clear ties to the exhibition itself. The book begins with an essay by Scarisbrick on the historical development of the tiara as an art form. Subsequent chapters form a "gallery," in which the pieces included in the exhibition are arranged according to their creation date. The gallery spans two hundred years of tiaras, beginning with pieces from the Napoleonic era and moving into contemporary examples. The book also includes a brief description of Chaumet's in-house collection of tiara designs and concludes with a checklist of the pieces included in the exhibition. This last bit is especially helpful for those interested in specific tiaras, as it includes information on the maker of each piece, the materials used, and the ownership of the tiara ca. 2000. The book itself also feels more expensive than your average exhibition catalogue. Tiara is a hardback book, and it includes 192 pages, printed on heavy paper. Unlike lots of jewelry books, this one is a more portable size, measuring about eight inches square and weighing only about two pounds. The text is rather small, and many of the photographs are tiny. That said, the book does include lovely pictures of the tiaras that were presented at the museum in 2000. Generally, each exhibition piece is presented twice: first with a larger photograph bearing a simple caption, and then with a smaller photograph that includes more detailed information about the tiara's construction and provenance. If you're looking for the grand, detailed photographs of a work like Roberts's The Queen's Diamonds or Munn's Tiaras: A History of Splendour, you may be disappointed. That's simply not the scale on which this book was published (unfortunately!). The majority of the tiaras in the exhibition are either pieces made for nobles or made as art pieces by various jewelers. However, there are some tiaras featured here worn by royals, too. Delightfully, some of them are tiaras that are rarely discussed in other venues. For example, the mourning coronet worn by Queen Hortense of Holland is included here, as is the gorgeous diamond laurel wreath tiara worn by Queen Margherita of Italy. Empress Eugenie's pearl tiara, Queen Marie of Yugoslavia's geometric emerald kokoshnik, and Queen Elisabeth of Belgium's Cartier diamond tiara are all here as well. For those interested in researching lesser-known jewels, Scarisbrick has translated some of the information from her excellent Ancestral Jewels to this book as well, featuring tiaras with noble heritage, including pieces worn by the Countess of Rosebery, the Marchioness of Londonderry, the Countess of Derby, the Countess Mountbatten of Burma, Lady Middleton, and the Duchess of Devonshire. I'd recommend this book particularly to these specific groups of people: those who love tiaras and want to own as many books about them as possible; those who are researching noble jewels; and those who are just starting out their royal jewel book collection and want to add a professional but inexpensive tome to their shelves. Tiara was only ever printed in a single edition fourteen years ago, so second-hand copies are available for pennies. At the time of this writing, prices on Amazon range from about $40 for a "new" book to an unbelievable 25¢ (plus shipping) for a used version. I purchased a second-hand copy of the book, and it arrived in good condition. If you're interested in owning this book, I'd suggest doing the same!